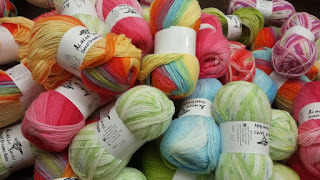 Fall Sale Spooktacular at the Yarn and Fiber Company!!! Hi Everyone and Happy October!!!! Each day we will be announcing a new sale at Noon for both instore and online customers! The first sale will be announced on October 1st, 2008 at 12:00 PM EST sharp! Check our blog everyday for the current sale as well as tidbits of information you can use to impress your friends regarding the craft we love (knitting, crochet, spinning and weaving) and a daily connection to the Salem Witch Trials and Halloween. The final day of the sale will be October 31st - we will celebrate Halloween at the store with an all-night knitathon "party". Costumes are optional. More details will follow as plans develop to make this event "a lot of fun"! All ideas are welcome! What fun we shall have my pretties! During the month of October, we are accepting donations of small Teddy Bears that will be donated to children who are in need of the comfort of a snuggly bear. We will be providing our customers both online and instore with links/printouts to free patterns for knit and crocheted Teddy Bears. 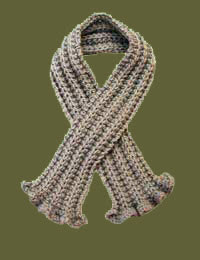 If you will be mailing your donation, please ship to The Yarn and Fiber Company, 11 Manchester Road, Derry, NH 03038. We will be accepting all types of "new" teddy bears - handmade as well as commercial. We will post the number of bears we receive as they arrive on our blog as well as the free patterns to the bears with our first sale post. Thanks! Yes Misti Alpaca is now available at The Yarn and Fiber Company, this super soft alpaca yarn comes with free patterns available at http://www.mistialpaca.com/ for scarves and sweaters. We are starting up the Ribs and Ruffles scarf pictured left. 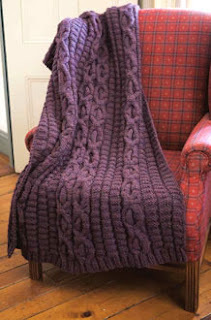 This uses just one skein of Misti Alpaca Chunky, and the patterns is free, hard to beat that! 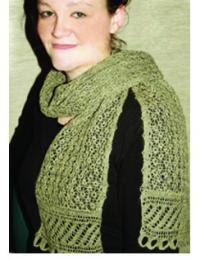 We also are happy to carry Misti Baby Alpaca Lace yarn, also available with free patterns like The Asphodel Lace Scarf from Misti Alpaca, a beautiful lace scarf that uses only 1 skein of Misti Baby Alpaca Lace yarn. Finished Size: Approx. 8 inches x 96 inches blocked. Cherry Tree Hill was actually the very first yarn line that we brought into the Yarn and Fiber Company, and has always been one of Cyndi's favorites. Cheryl Potter has also visited us a couple of times to do hand dye classes, which we found very inspiring. 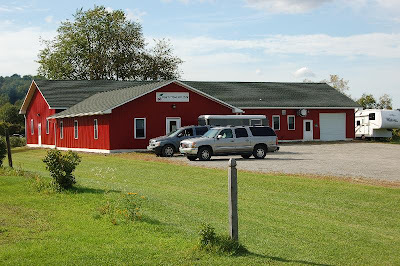 It was our turn to make the trip up to Vermont (about 3 hours away) and see Cheryl's hand dye studio and her farm, and pick up some more of her great products (see the new patterns and yarns on the website) Also Cheryl's new book on yarn substitution Skein for Skein is now available. Cheryl has a nice wholesale showroom, certainly a great place for us to pick out new yarns to bring to our customers, and we spent a good couple of hours touring the dye studio (you can see this if you buy Jenna and Cheryl's new video "The Indie Dyer Experience") it really is quite impressive! 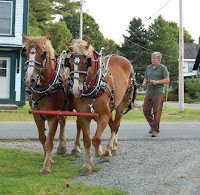 Cheryl and Terry (Cheryl's other half) also have Belgian Draft Horses, and riding horses on their farm, as well as a very old (18th century) Maple syrup business. 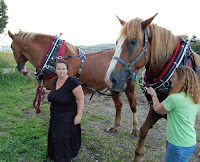 We were fortunate enough to spend some time with these wonderful horses. This included a very nice ride through historic Barton, Vermont. Pictured left is the 18th century "Sugar Shack" that is still used today for the production of Cherry Tree Hill Maple syrup. Completely "green" they use wood from the farm to power the equipment! Thanks Cheryl and Terry for a great day!